Pictures are often more powerful than words and so it is as we mark the first anniversary of Hurricane Sandy. 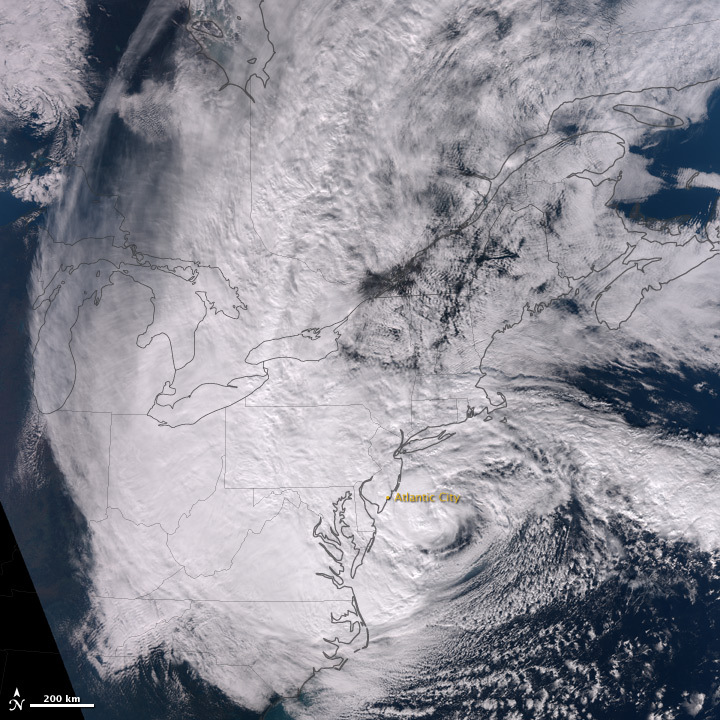 This NASA image shows Hurricane Sandy approaching the U.S. East Coast at 1:35pm Eastern Daylight Time on October 29, 2012. Remember that over a dozen states were impacted by Hurricane Sandy which caused $18.75 billion in insured property losses, excluding flood insurance claims covered by the National Flood Insurance Program (NFIP), according to estimates from ISOÃ¢â‚¬â„¢s PCS unit as of January 18, 2013. A report by Guy Carpenter titled Post Sandy: Damage Survey details observations and photos from Guy CarpenterÃ¢â‚¬â„¢s 10-day on-site assessment of SandyÃ¢â‚¬â„¢s impacts for the most severely affected areas in Rhode Island, New York and New Jersey. The photographs and findings document the scope and severity of damage and economic impact of Superstorm Sandy over affected regions across the Northeastern U.S., an area that produces approximately 10 percent of U.S. economic output. And over at NOAAÃ¢â‚¬â„¢s Ocean Service, you can compare aerial images of New Jersey captured shortly after Sandy passed over the Eastern Seaboard with new pictures of restored areas. Mashable has also taken some of the most iconic photos from Hurricane Sandy and juxtaposed them with images of the same places today. Meanwhile, the New York Times Lens blog tells of a photography exhibit and book showing the impact of the Hurricane Sandy on the city and its residents. With two months to go to the one-year anniversary of Hurricane Sandy, a federal task force created after the storm has issued a report thatÃ¢â‚¬â„¢s getting a lot of media coverage. The plan includes 69 policy initiatives, of which a major recommendation is to build stronger buildings to better withstand future extreme storms amid a changing climate. One section of the plan focuses on addressing insurance challenges, understanding and affordability. Specifically, the taskforce recommends: streamlining payouts to policyholders in the wake of disaster; improving policyholder awareness of factors that affect flood risk and insurance rating decisions; and studying affordability challenges of flood insurance as the National Flood Insurance Program (NFIP) transitions toward full risk rates. As the United States braces for another drought in the coming months, Swiss Re reports that record heat and extremely dry weather conditions in the United States in 2012 led to one of the worst droughts in recent decades and the highest ever recorded loss in agriculture insurance. Swiss ReÃ¢â‚¬â„¢s latest sigma study reveals that worldwide natural catastrophes and man-made disasters in 2012 caused insured losses of $77 billion Ã¢â‚¬“ making 2012 the third most costly catastrophe year on record. Still, this is significantly lower than 2011 when record earthquakes and flooding in Asia Pacific caused insured losses of over $126 billion, the highest ever recorded. Overall economic losses from natural catastrophes and man-made disasters in 2012 reached $186 billion, with approximately 14,000 lives lost. Hurricane Sandy was the most costly event for the year, causing $70 billion in economic losses and $35 billion in insured losses (of which $20 billion to $25 billion was covered by private insurers and the remainder by the National Flood Insurance Program (NFIP)). In fact, nine of the 10 most expensive insured loss events happened in the U.S. in 2012. Fortunately, the high insurance penetration in North America meant that $65 billion Ã¢â‚¬“ over half of the $119 billion in economic losses in the region Ã¢â‚¬“ were covered by insurance. Check out I.I.I. facts+stats on global catastrophes.